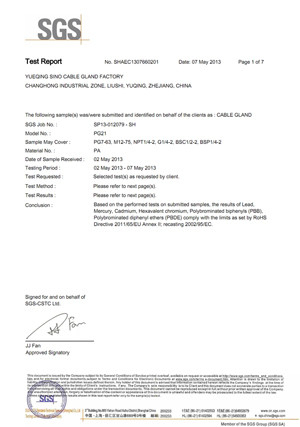 * Sealing Nut, Locknut & Body: UL-approved new Polyamide 66,94V-2 (94V-0 is optional). 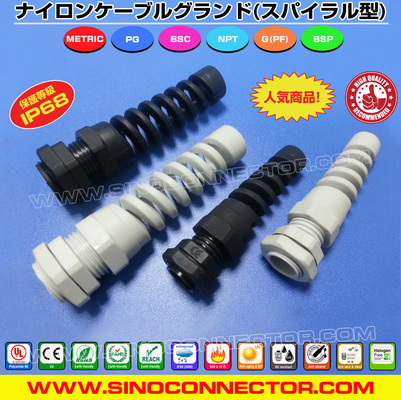 * Seal & O-ring (Washer): oil-resistant NBR (available in weatherproof EPDM, Natural Rubber & Silicone rubber). It can reach IP68 (only if assembled with O-ring or Washer within its specific cable range). CE, ROHS, PAHS, REACH, SGS & IP68. 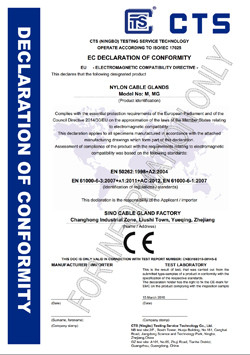 These earth friendly non-metallic cable glands comply with the ROHS, PAHS, REACH directives of European Union. Waterproof & liquid tight, resistant to weak acid & alkaline, corrosion-resistant, UV stabilized, anti-aging, insulating, durable, long-life, etc. Designed with anti-bending spiral spring & wide cable clamping range, such glands offer excellent cable protection against excessive twist at the bending point to reduce the risk of break to avoid electric leakage. With the characteristics of strong tensile strength, high sealing & anti-bending performance, good security and stability, they are widely applied for connecting and fastening cables or wires to provide effective protection against dust, water, oil, weak acid, alkaline, alcohol, solvents in the fields of electrical and electronic technologies, moving machineries, telecommunications, network communication, automatic control, power supplies, switches, motors, distribution boxes, solar PV modules, Inverters, lightings, displays, traffics, signals, surveillance cameras, plant engineerings, installations, meters and instruments, etc. * PG7, PG9, PG11, PG13. 5, PG16, PG21.